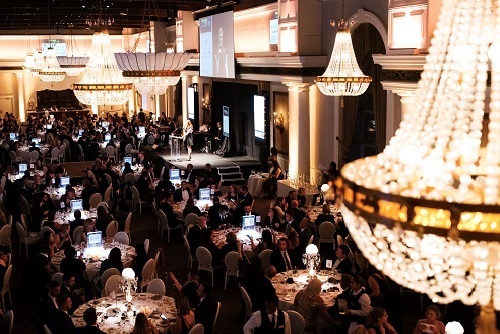 Insurance Business is pleased to reveal the winners from the third annual Insurance Business Awards that were announced last night at the gala event held at The Liberty Grand ballroom in Toronto. Professionals from coast to coast attended the awards show and celebrated their industry’s top talent, who brought home the coveted Insurance Business trophies. During an evening filled with gowns and tuxes, victory speeches and high spirits, hundreds of leaders from the world of insurance came together and waited with bated breath to find out who would be this year’s honourees. The winners included DSB Claims, winner of the Winmar Award for Excellence in Claims Service, whose leader reflected on why the Oscars-style event is an important tradition for the industry. “We need to recognize and reward our peers – recognize all the work that they do for the industry and that they do for each other,” said Dara Banga, DSB Claims’ president and chief adjusting officer. Awards covered companies and leaders from across the insurance industry, with winners in 21 categories. The event was produced by KMI Publishing and Events – the organization behind Insurance Business magazine and insurancebusinessmag.com. It was an evening of celebration, especially for Lindsay Donelson of FirstOnSite Restoration, who took home the award for Business Development Manager of the Year. “The awards recognize that our industry and the company I work for has established itself in a niche market with Lloyd’s of London, and has been able to provide different services that were never thought of outside the box before,” she said. Dina Godinho - Jones DesLauriers Insurance Management Inc.
Tammy McCarthy - Bryson & Associates Insurance Brokers Ltd.